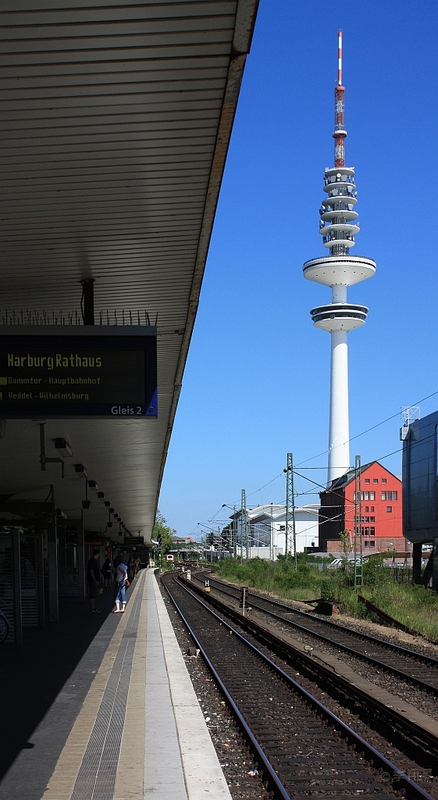 Heinrich-Hertz Tower, from S-Bahn Sternschanze : Hamburg, Germany – 27 June 2010. The physical units of frequency (oscillation) are cycles per second (e.g., 60 cycles per second), but the metric (or SI) unit of Hertz is also used for frequency (e.g., 60 Hertz). The SI unit of frequency is named after Heinrich Hertz (1857-1894), a physicist who was born in the city of Hamburg, Germany. Visible from just about anywhere in Hamburg, the television tower was finished in 1968, and now bears the name of one of Hamburg’s famous sons and physicists. I made this photograph at S-Bahn Sternschanze station while waiting on platform 2 for the next southbound S31 train to Harburg Rathaus. This post is published originally at Fotoeins Fotopress (fotoeins.com).